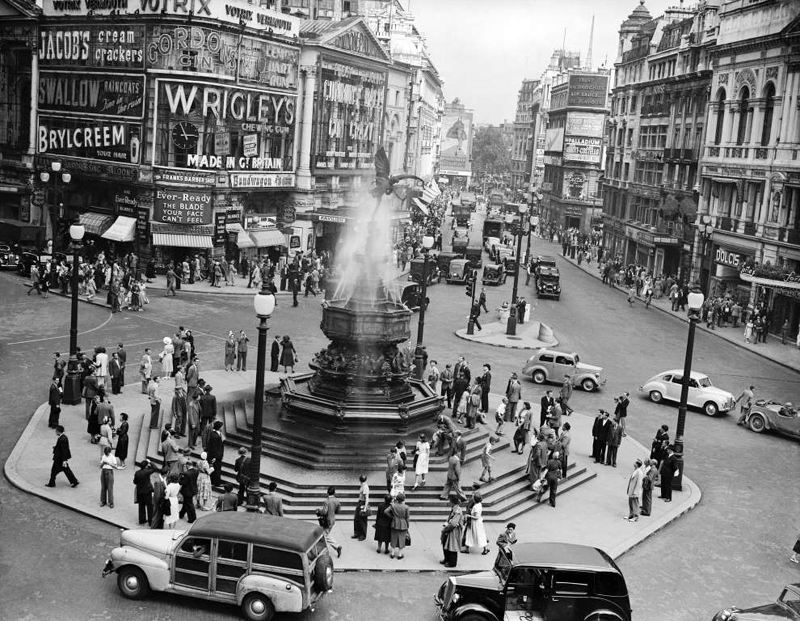 These days, Piccadilly Circus is famous all over the world for its neon signs, bustle of people and the Eros fountain located in the middle of the road junction. The legendary spot was first founded 200 years ago, in 1819. When Shaftesbury Avenue was built in 1886, the junction ceased to be a complete circle. 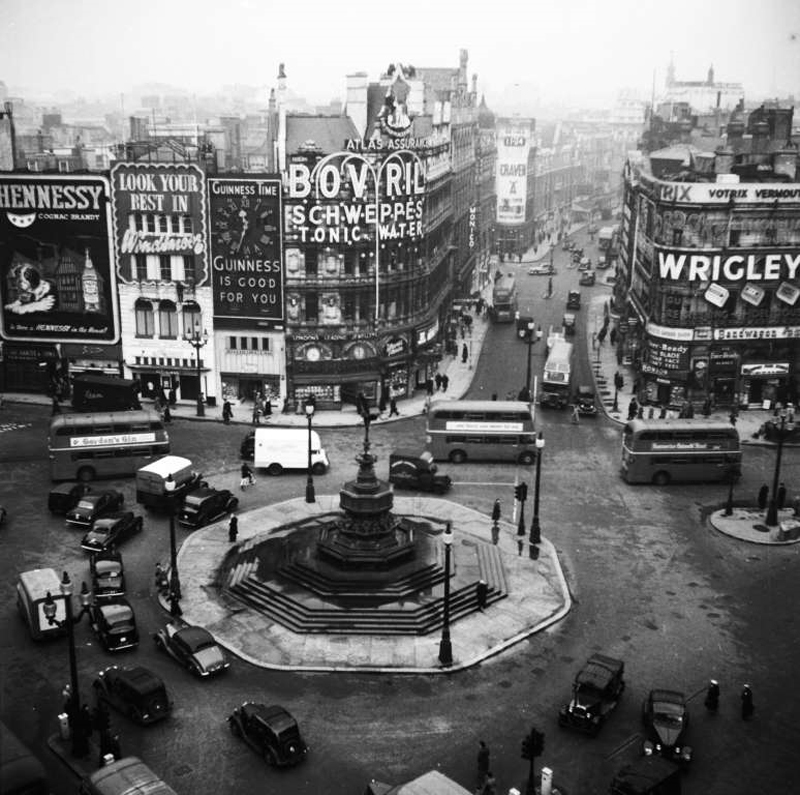 Piccadilly Circus was created to act as a hinge in Regent Street, ensuring the grand processional route created by John Nash in the 1820s - from Regents Park to the Prince of Wales’ palatial residence Carlton House - had a suitable sweeping majesty. 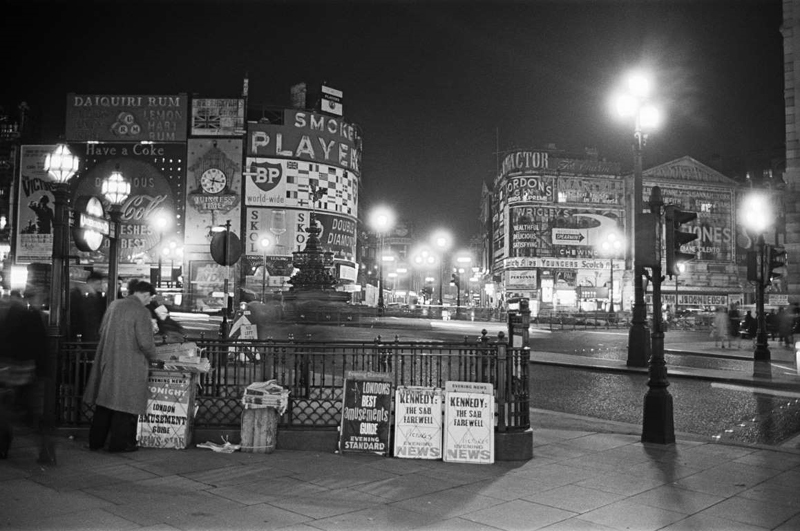 Probably the most famous feature of Piccadilly Circus is its light-up advertising boards. The first sign to be illuminated was a Perrier advertisement in 1908, which used incandescent lightbulbs. Neon was first used for a Bovril sign in the 1940s, as seen here. 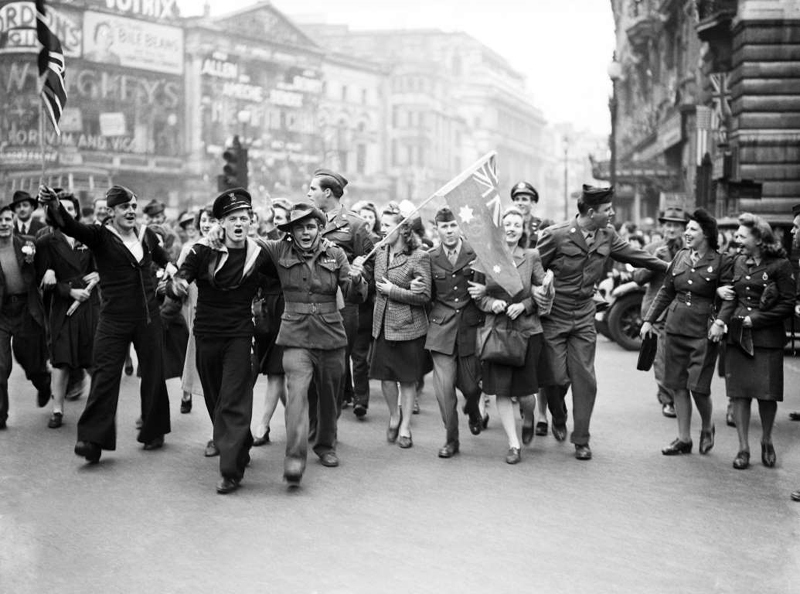 At the end of World War II, huge crowds gathered around Piccadilly Circus during the celebrations with servicemen and women waving their nation's flags. The area has always been a hub of activity. 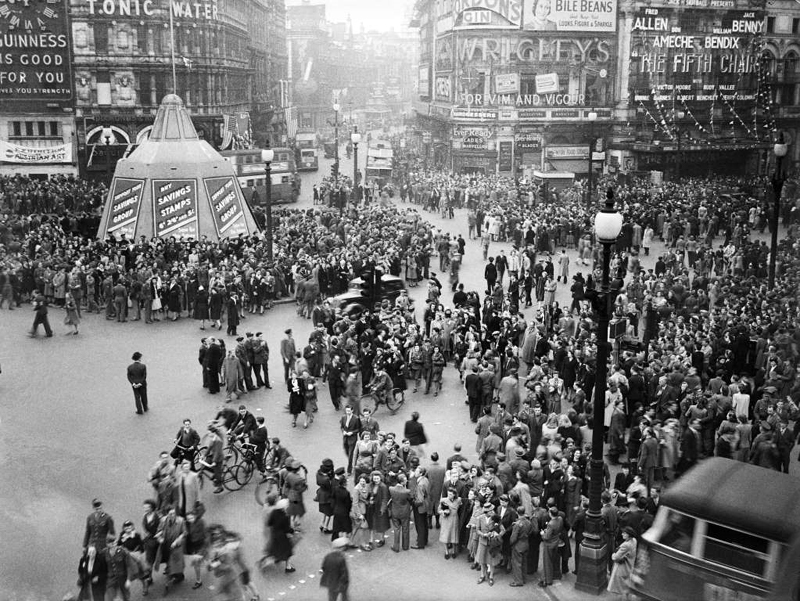 Hence the saying, 'it's like Piccadilly Circus,' meaning a place has lots of comings and goings. 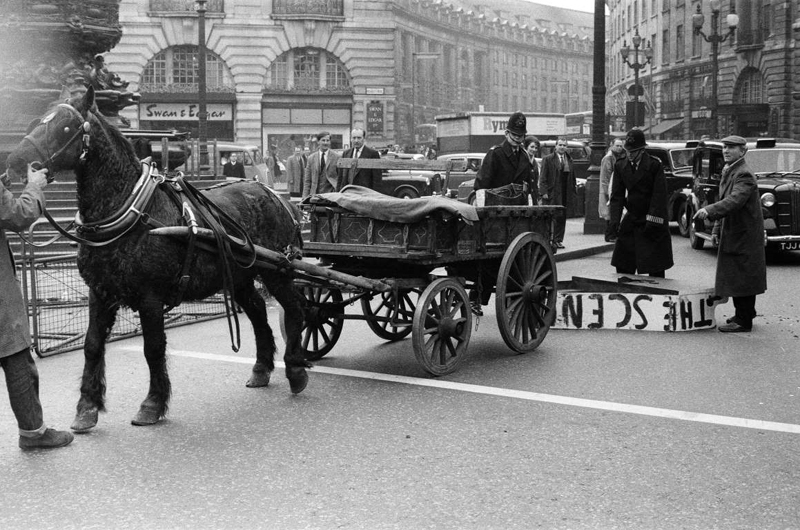 Where does the word 'Piccadilly' come from? In 1612 a man named Robert Baker built a mansion house near what is now Piccadilly Circus. He got wealthy selling Picadils, stiff collars worn by gentlemen in court. Locals derisively called his mansion Picadil Hall - and the name stuck. 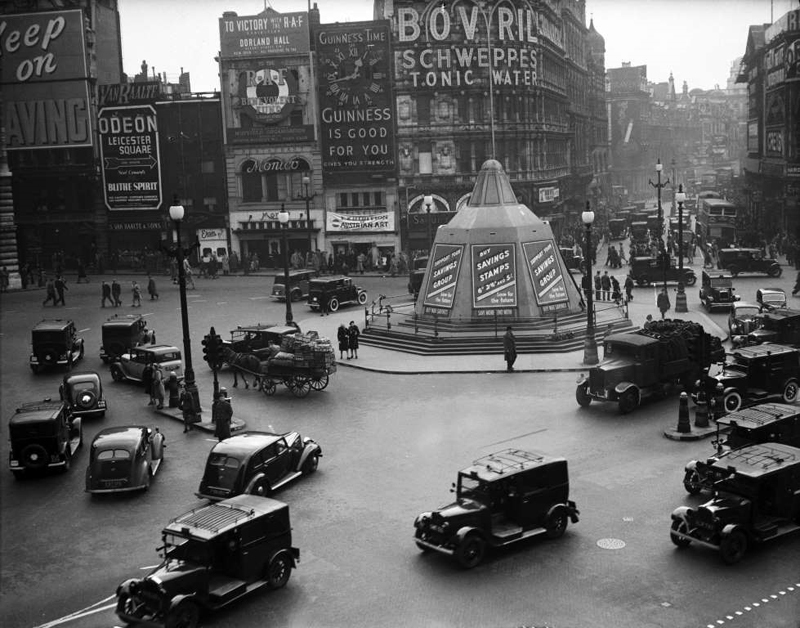 Just five years later and Piccadilly remains largely unchanged, though the cars and advert displays were becoming increasingly more modern. Heard of the Seven Noses of Soho? It's rumoured that anyone who tracks down all of the sculpted hooters will have infinite wealth. One of them is mounted to a wall somewhere in Piccadilly Circus. Where? Not telling! 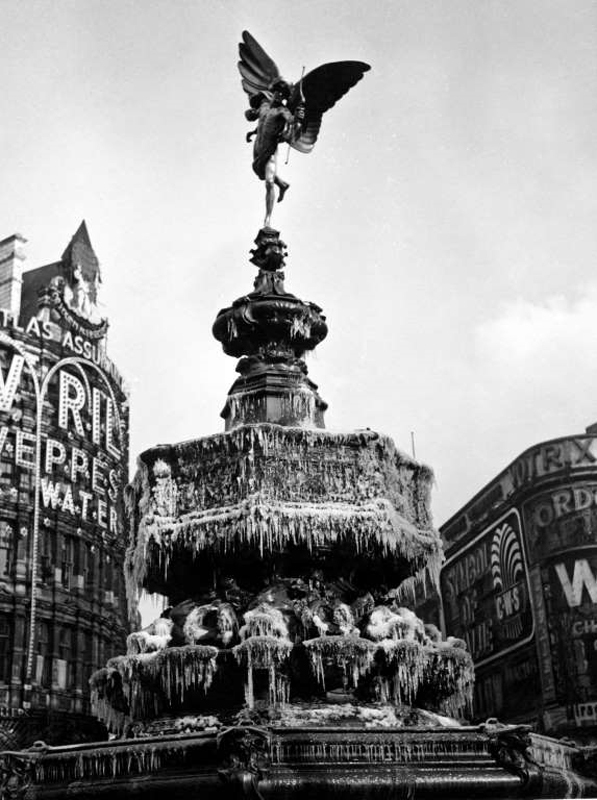 The statue of Eros covered in frozen icicles, February 1956. Before the cups were stolen, it was possible to drink from the fountain, with the Duchess of Westminster doing so at its unveiling in 1893. Perhaps not in this weather! 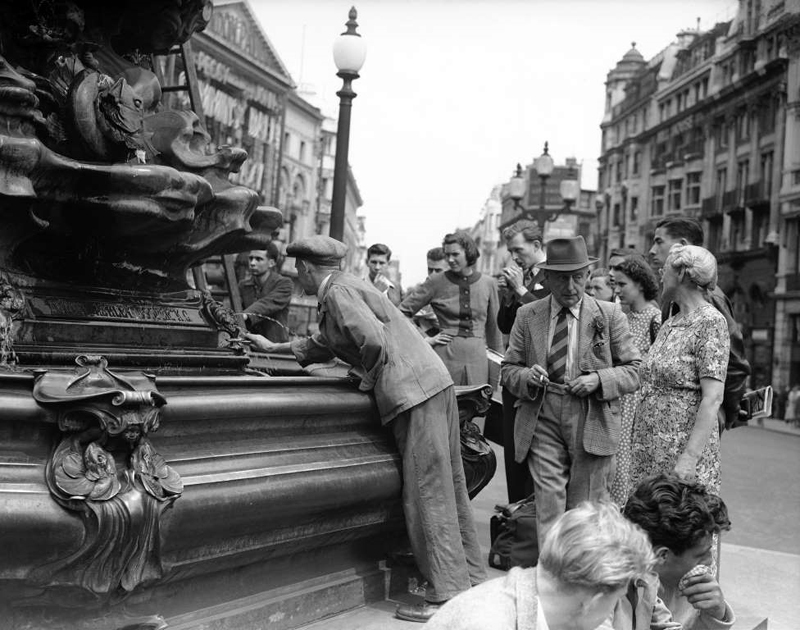 It was the first London statue to be cast in aluminium. 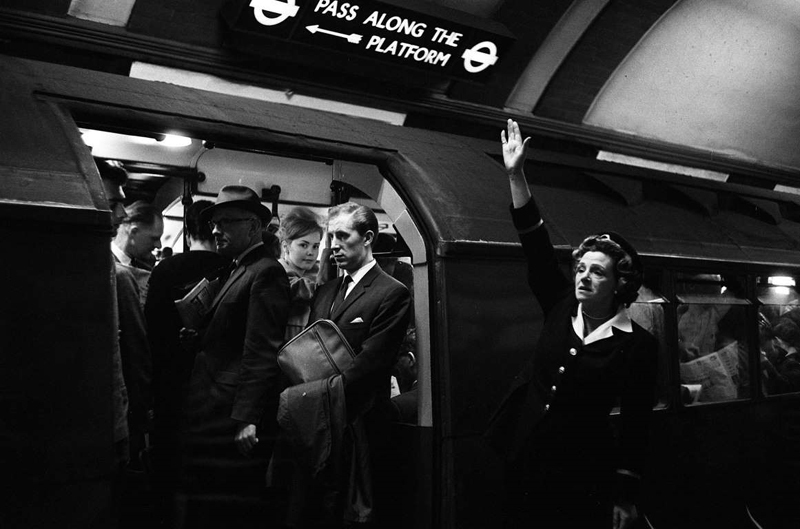 Grade II-listed Piccadilly Circus tube station (right under Piccadilly Circus itself) is one of the only stations to exist completely underground. When it was built in 1906, a surface level ticket office existed, but when the station was revamped in the 1920s, it was demolished. The first ever James Bond film 'Dr. 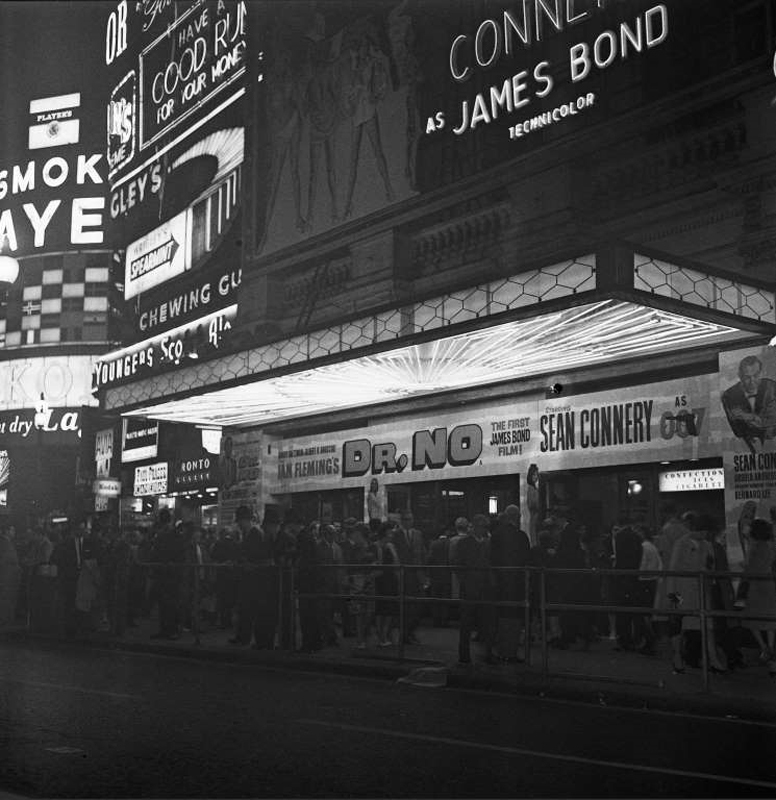 No' was screened at the London Pavilion, Piccadilly Circus, in October 1962. The famous lights were switched off during WW2, and since then the Advertising Association had the electric sign displays switched off until 8pm as a tribute to John F Kennedy when he was assassinated in 1963, for the funeral of Winston Churchill in 1965, then again for Diana, Princess of Wales in 1997. 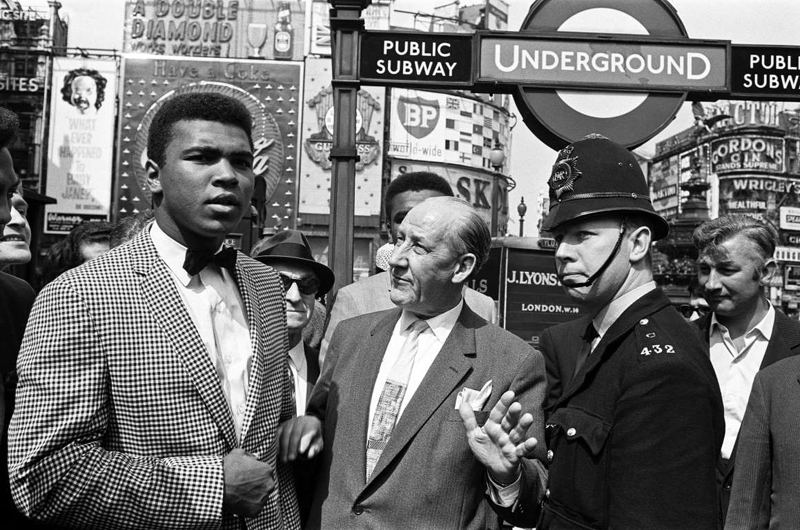 Piccadilly has always attracted tourists - even famous ones! 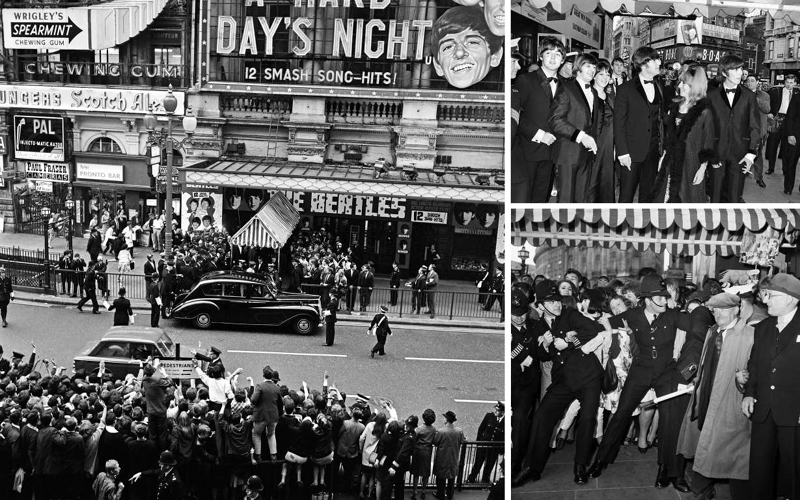 In 2002, Yoko Ono once spent an estimated £150k to show the lyrics from her late husband John Lennon’s song Imagine in Piccadilly Circus. ‘Imagine all the people living life in peace’ were the words displayed simply in black on a white background for three months. A unisex and menswear fashion show right at the end of the so-called Swinging Sixties, in 1969.